The frogs are flowering. The "frogs" are a group of related orchid species within the vast subtribe Pleurothallidinae. (Acronia section Macrophyllae-Fasciculatae or Pleurothallis subsections Acroniae and Macrophyllae-Fasciculatae, depending on who you ask). The hooded sepals and spongy lip give the flowers the whimsical appearance of open-mouthed frogs. They are awesome. What's inside those gaping mouths? Frog flowers can be baffling if you approach them with the expectation of seeing the conventional 3 + 3 arrangement of orchid petals and sepals. Here is a close up guide to a couple of the larger species, Pleurothallis gargantua and Pleurothallis marthae. The dorsal sepal is usually erect and often concave. The lateral sepals are fused to form a synsepal. 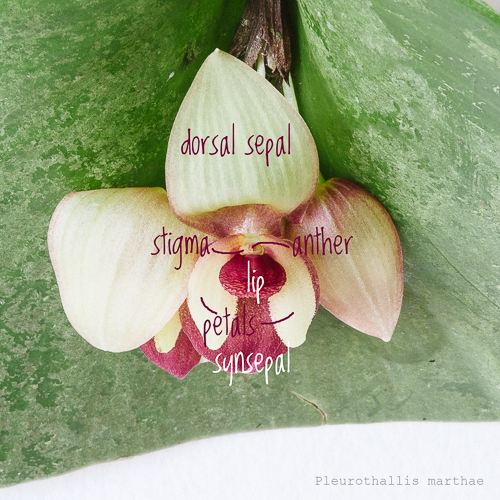 Lying opposite each other like the two halves of a clamshell, the dorsal sepal and synsepal give the flowers their mouth-like appearance. Pleurothallis gargantua (above) is a spectacular example and the largest of the frog Pleurothallids. Pleurothallis marthae produces flowers that seem to remain half open. 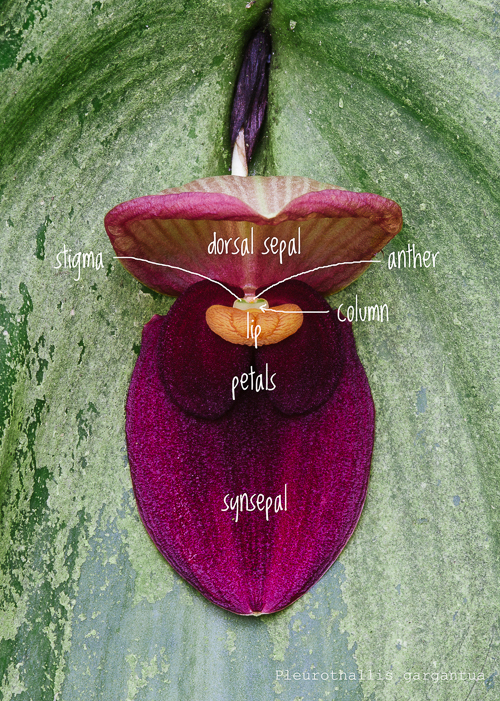 In the photo above, I've pulled back the dorsal sepal so you can see the interior of the flower from above. The column is short and the stigmatic surface is at its apex, not on the underside. The tiny anther has a detachable anther cap covering a minute pair of teardrop shaped pollinia. 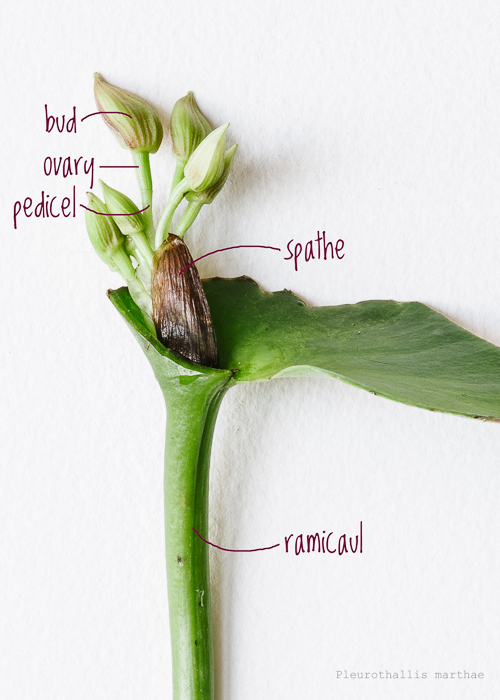 Above, I've cut away part of the leaf of Pleurothallis marthae so you can get a closer look at the inflorescence. The inflorescence emerges near the apex of the ramicaul, a secondary stem that looks very much like a petiole. (The actual petiole is quite short and is separated from the ramicaul by an abscission layer.) The inflorescence is subtended by a sheath, called a spathe, that mostly obscures the peduncles. From the peduncles the solitary pedicels arise, each surrounded by a clear tubular bract, and emerge from the spathe. Among frog Pleurothallids, flowers are produced singly and one at a time (as in Pleurothallis gargantua), or singly and simultaneously (as in P. marthae). The 'frogs' in the Tropical High Elevation House are putting on an amazing show right now. Don't miss these terrific orchids! Very informative for the beginner orchid grower. Thank you very much.